Whoa doggies! Nineteen point five is a descending thruster/pullup slug fest. For those of you that did chest to bar pull-ups during 19.4….nice! You are good and warm for this workout. It looks like for most this will be a battle of work completed before the time cap. I hate to be the bearer of bad news but this workout consists of 105 thrusters and 105 pull-ups. In order to finish this bad boy, you’ve gotta be doing a little over 10 reps per minute. Below I’ve devised a thruster breakdown plan if you like that sort of thing. You can write down your goal reps and bring them in with you when you do the workout. It’s nice to come in with a plan. My main notion for this workout is DO NOT GO OUT TOO FAST. 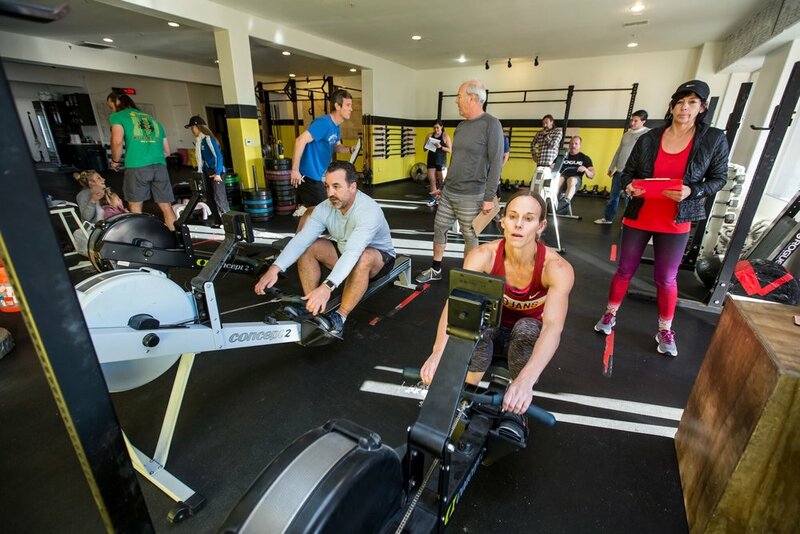 If you crush 33 thrusters in round one, there are still 70 more waiting for you. Check the clock every so often and see how many reps you have done that coincides with minutes elapsed. If you’ve done 50 reps in 2 minutes, you're either going to break the world record or crash and burn at minute 12. Tara: first pullup! Tara has been putting a lot of time using the bands and improving her strength. On Monday, she unexpectedly (and quite gracefully) jumped on the bar and did 3 pullups! Palmer: first bar muscle up! “The Rhino” may be known for his strength but he sure can get gymnasty when he wants to! H-Mark- notching the best score in the gym (116), Mark was able to make the 65lb power snatches look like a breadstick. His split time for the first part was 4:19, blazing fast. Mark currently sits just outside the top 500 in his age division worldwide! Young Ben: he eclipsed the 100 rep mark on this workout. Ben was able to complete 20 total bar muscle ups in 19.4. Only Ryan and Miguel had a higher score than YB. Brett M: he took a few months off from training and then showed up for the first Open workout. Since then he was been getting steadily for fit as the Open progresses. This week, he logged a score of 103 with chest to bars (a movement that is still quite new to him). His effort on 19.4 was truly impressive. Kathy: she had the #1 female score in the gym this week! Kathy was able to get 8 chest to bar pullups. She currently sits in 509th in her age group in the world! Jeff P- he ended up with an RX score of 92, which is a total of 16 chest to bar pullups! Bob- plus 5 reps to 97 total for chest to bars. He was also able to beat out his arch gym-rival, Dahlia, tying their match 2-2 overall. Look for an epic head to head battle between these two for 19.5! Mark Sp- perhaps the most fruitful redo was by young Spalding. In his first attempt, he raced through the first part and left it all out there. He also left out his bar muscles ups. However, he gathered himself for a repeat of Monday…and came through big with 6 bar muscle ups! We are not doing heats for tomorrow night. The 3 hour window has allowed folks to show up, warm up and do the workout with a couple of other members. If there is a very specific time you need to do the workout, just show up 30 minutes before that time and we will get you going on time! Make no mistake folks, that first 3 rounder is a sprint. Im not saying you need to sprint, Im saying you to attack those 3 rounds like there is no tomorrow. Because the 3 minutes of rest will at least allow you to advance to the next 3 rounder. So strategically, attack the first section like our “go fast days”, knowing that rest is coming. As far as scoring goes, doing 1 rep of “one” is more valuable than doing 5 reps of “two”. 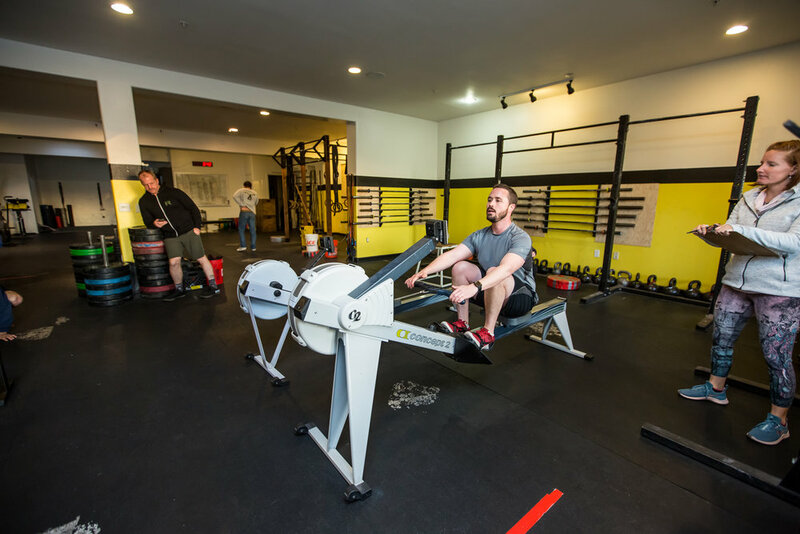 However, we will urge you to choose the option where you can get some work in and then you will be ranked amongst those also doing that specific movement. Keep in mind you must be done with the first 3 round workout in less than 9 minutes to advance to the second 3 round workout. For the sake of speed, try to maximize the tap n go on the power snatches early on. Singles should only be used if 95/65 is a heavy weight for you. Remember you’re not trying to conserve too much energy out of the gate. The goal is to get to the 3 minute rest as fast as possible. The burpees in round one and 3 should look pretty similar. Make a point to try and work for that. Round 2 might get slow because at that point you're “in it” and starting to feel some feels. But round 3 is a dash to the 3 minutes of rest. Dr Lynn: she did all 200ft of the lunges with the same arm. Lynn has been dealing with a shoulder injury but was still able to complete 19.3 as prescribed! Tara: she did 15 unbroken strict HSPU’s to finish her 19.3 effort. There was no end in sight either; if she had more time, I think she would’ve just kept going until she got 50! Palmer: he absolutely stormed through the first 2 movements. This gave him enough time to rattle off 15 strict HSPU’s! Amy A: her score of 108 (18 strict HSPU’s) was second best amongst all members. Her effort placed her 279th in her age group division for 19.3! Husky Mark: he earned the top member score in the gym with his 118 (28 strict HSPU). He currently sits in 550th in the world in his age division! Every year a workout (or two) is announced that seems to shake up the community. This is probably THAT workout for 2019. I know what you may be thinking “holy cow, 50 strict HSPU’s!” This is if you get there. Ten minutes is a pretty tight window to do 200 feet of lunges and then 50 step ups. However, we coaches will do our very best to assist each individual in devising a safe plan to complete this workout. Lunges: I would recommend switching arms after every 25 feet. If you have stellar overhead stability, perhaps you could do 50’ and then switch. If you have a shoulder issue on one side, you may bias the “good side”. Longer steps will be rewarded here. Map out exactly how many steps it will take you during the warm up and try not to deviate from that plan. Step Ups: the DB can be held anywhere. Boom box style on one shoulder, back pack style across the traps, farmer carry style, goblet style, and anywhere else you can think of. PRACTICE multiple styles in the warm up to determine what you like best. Then use that style for a majority of reps and switch it up when you get tired. 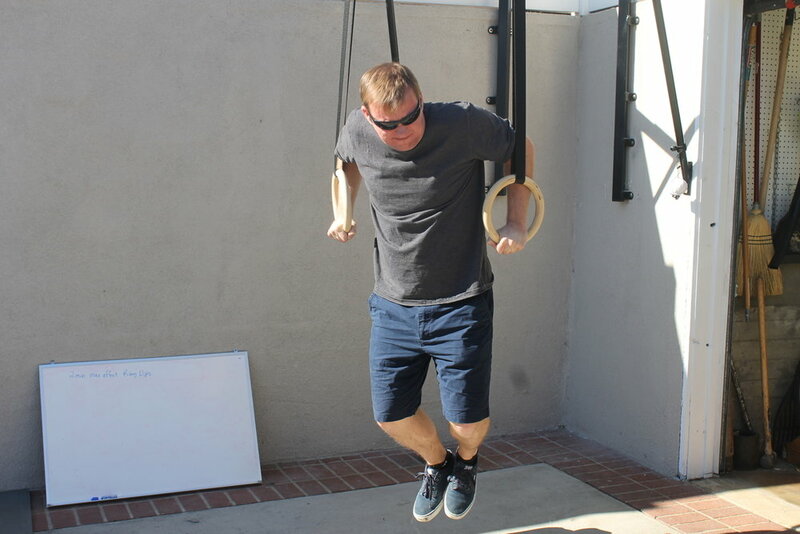 Strict HSPU: this is certainly in the muscle up realm where you either have them RX or you don’t. 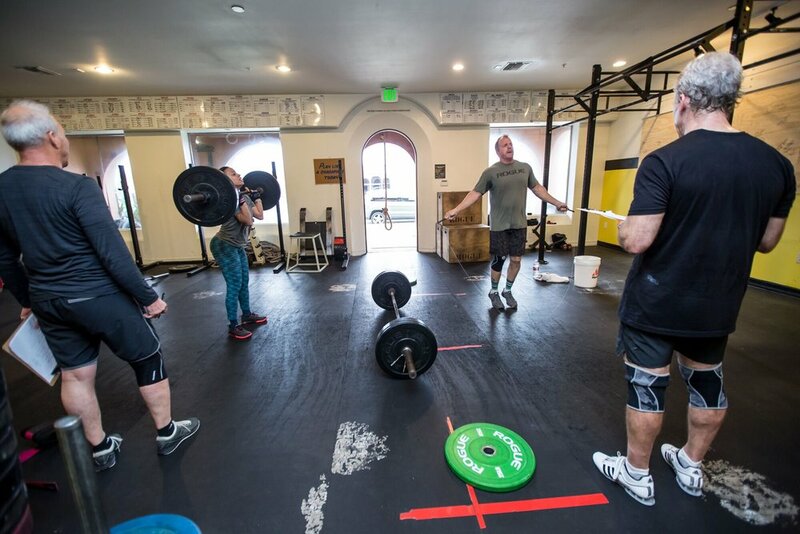 But, ,maybe you have been close in training and have not attempted an RX strict before…and the Open will allow you to practice and get a few. The coaches will help those who are close with positioning, strategy etc. Lina- +12. She came in on Sunday with a mission to PR. The result was her DU’s were much more consistent, leaving more time to attack the 85lb bar and get the PR! Bob +13 reps. It was all about the DU’s for Bobby Squats. In his second attempt he completed the DU’s in 4:27…90s faster than his first attempt. Joe S +1 clean @185. Joe was able to get 2 cleans at 185. He also PR’ed his clean on Saturday by 15lbs at 215! Mark Sp: Mark had an outstanding score of 170 (5 cleans at 185lbs). He PR’ed by two cleans on his redo. Amy A: she was the only female in the gym to successfully clean the 115 bar! Miguel: in 2016, Miguel did this workout and scored a 167 (2 cleans at 185). This year, he made it through all 13 of 185’s AND got one rep at 225! 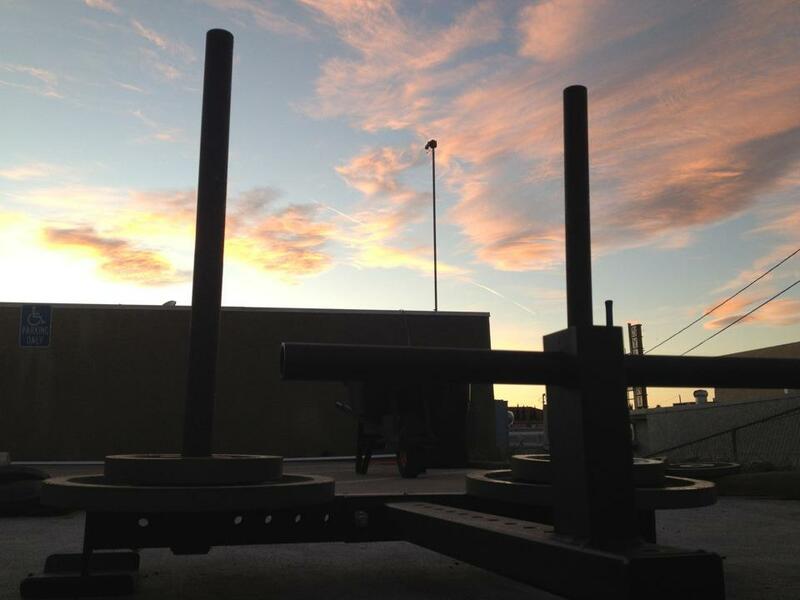 Steven D: on Friday night, Steven did the workout scaled…and crushed it. He came back in on Monday and attempted the workout as RX. The result was: 25 toes to bar, all 50 DU’s and 1 rep at 115! 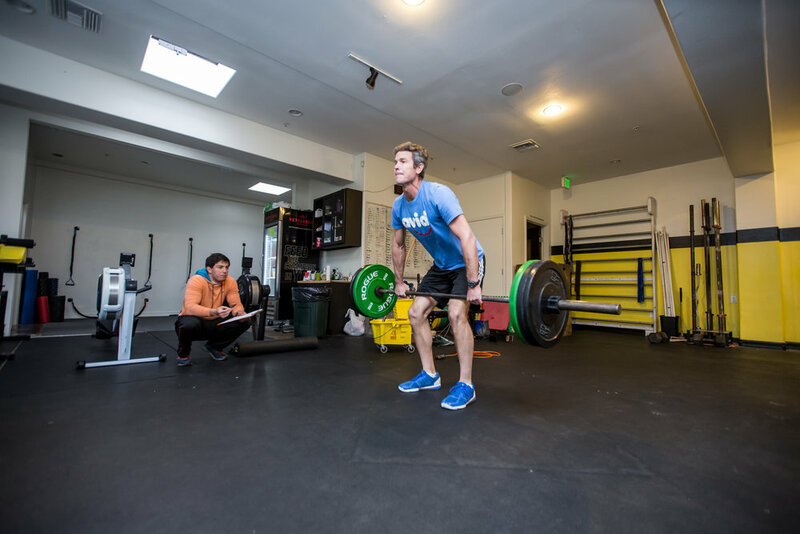 Jeff P: one of our beloved Master’s, Jeff was able to get through the first 75 reps as RX and then managed 5 cleans at 115! Meghan: this is Meghan’s first Open! She jumped right in by coming to Friday Night Lights and supporting, judging and cheering on her fellow gym compadres. Meghan also used the 14lb wall ball for the first time during 19.1! She did over 80 of them! Steven D: used the 20lb wall ball for the first time. Every time I saw him doing wall balls, it looked like he had been using the 20 for years! Hannah: first time using the 14lb med ball and her first Open. She fought hard through the wall balls and then rowed impressive pieces for her 19 calories! The tall dudes that can breathe (have great cardio) really feasted on this workout. Ted, Mike Sp, and Brian L all got 7+ rounds. Mike Spalding had the top member score in the gym with 285! Let’s welcome two of our long time members to the 55-59 age categor: Tara and Husky Mark! Enjoy the lighter weights guys, but we just expect you guys to go a bit faster! Congratulations to Team Chan for their week 1 victory! This team had the most participants which contributed greatly to their week 1 win. The slate is wiped clean for week 2 and we hope to see even more participation on all teams!